Connect with Swedish businesses easily after you download our human-verified list of targeted local sales leads! If you've been trying to grow your business in Sweden, this is the database you need to conduct better outreach and make real, local, strong connections. Make waves on the Baltic Sea when you've connected with the right B2B contacts in this internationally valuable European market. Use our Sweden email list to connect with local businesses who are more likely to help you grow your influence in the area from the ground up. We've collected a vast array of valuable business contacts into this one, huge Swedish business database, but remember that you can also use our custom list-builder tool to narrow your search to specific industries or job titles. Some of the most important industries in Sweden are the timber, pharmaceuticals, telecommunications, and automotive industries. You can also download the lists of nearby countries like Denmark and Norway to conquer the entire Scandinavian region. 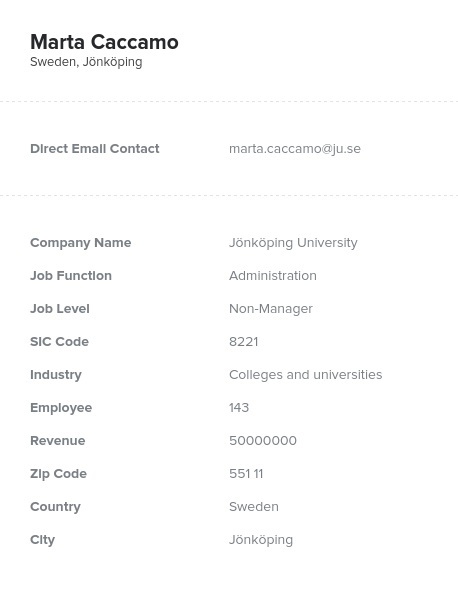 In this Sweden email database, however, you'll find an organized lead list that's full of all of the information you need to network with local Swedes: emails, phone numbers, fax numbers, addresses, and more. Download this directory as a .CSV file and pull it into your CRM system to get started. Then, you can sort by other factors like job title. Buy our mailing list of Swedish business contacts and reach across thousands of miles by calling, emailing, or sending mail to these great Swedes today.